Jordan! Petra! 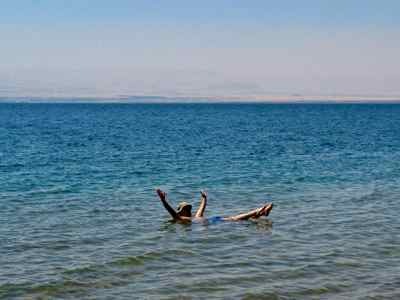 The Dead Sea! The Red Sea! Then the next question, "What's in Jordan?" To the first question…. Yes, it’s safe. And No… it’s not just camels and desert. 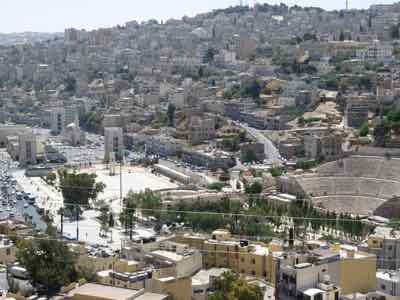 And it’s more than the capital of Amman which is a modern bustling city that just happens to have some Roman ruins in the center. Friendly people and good food. It's easy travel in the Middle East... at least it was when we were there. Independent Travel or Group Tour? Apparently travel in the Middle East makes Americans nervous because almost everyone we know wanted to know if we felt safe there. The answer is definitely YES. And we went independently.... if you haven't figured it out by now, we're not big on tours.... we just like to wander too much for too much structure. It was easy enough getting around that we don't feel the need to recommend a tour, though some people might feel more comfortable with a tour. 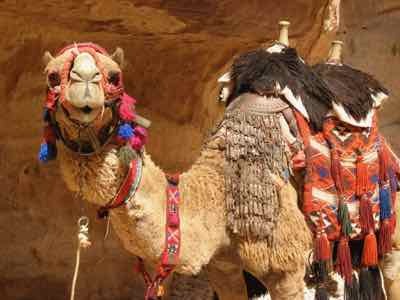 A private tour through a local tour operator would be a good choice for that if you don't like large group tours. See what we say about setting up your own Custom Tour. We did have the advantage of knowing someone in Jordan... sort of. Our travel buddy who went with us had an old friend who was Jordanian. His apartment in Amman was vacant, and we stayed there while we were in Amman. The beauty of that, of course, was that we stayed in a neighborhood and mingled with the locals. 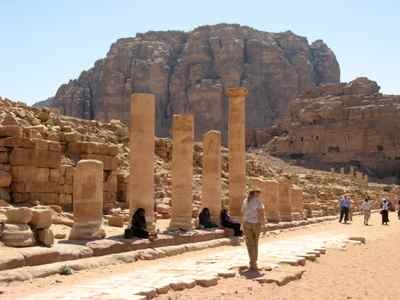 Jordanians are conservative and Muslim, but they are tolerant of visitors. As long as you dress modestly and behave politely and respect their ways, there is no problem. And we believe that is how all travelers should behave anywhere they go... remember we think that all travelers are ambassadors. It's what can make travel great. OK this was a relative of our friend, but staying in a hotel and hiring a licensed taxi driver would be just as easy. You could rent a car.... we almost did. There were enough signs in English as well as Arabic that you could get around; we talked to a couple who did that, but they also admitted that they spent a fair amount of time lost. In the end we were happy with our car and driver. I consider myself an ace navigator, but there just weren't quite enough signs in English, and having watched Atef navigate through Amman, we decided that could have been more of an aggravation than just a challenge. We spent a week in Jordan. That was plenty of time, though we could easily have filled a couple of more days. I'll sketch out our itinerary. It worked well for us and it will give you an idea of how much time to allow if you want to visit. My short version is that we stayed in Amman, visited the Roman Ruins of Jerash, floated in the Dead Sea, went diving in the Red Sea, explored Petra and slept with the Bedouins. Flights tend to arrive and depart at odd hours in Amman. We arrived about 8 in the evening... our departure was at 2 in the morning! Day 1 Arrival and get to hotel... or rather our apartment in this case. 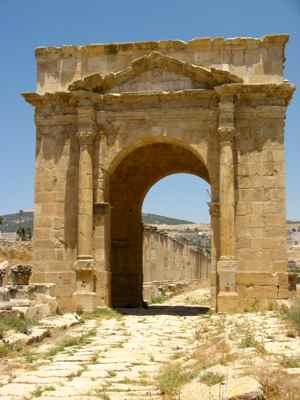 Day 2 Jerash... Apparently there is only one B&B type of hotel at Jerash and one small hotel within taxi distance. We didn't see either of these. You can make it a day trip like we did. That's also what most of the tours we read about do. Day 3 Dead Sea and dinner with our new friends.... you could stay at the Dead sea or make it a day trip. Day 4 Drive to Petra... takes about 2-3 hours on the Kings Highway. We didn't leave until 10... got there in the heat of the day and the peak of the crowds. Visit early in the day to avoid the heat... Skip breakfast and get there when they open, you'll have it to yourself! Petra deserves a page to itself, and I'll get to that someday. 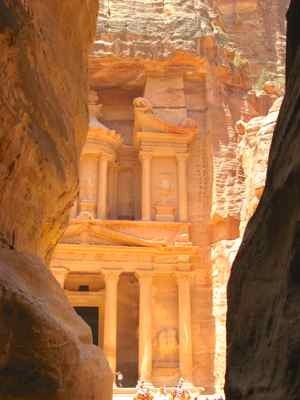 Let me just say here that there's more to Petra than just the "Treasury" that gets all the publicity! Drive to Wadi Rum. Our driver arranged a tour for us from Petra. In Wadi Rum we joined a Bedouin driver with a 4 wheel drive car. 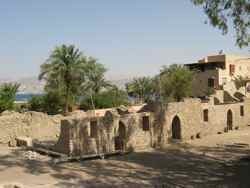 Saw Lawrence of Arabia's house, Lawrence's spring, wall of inscriptions. 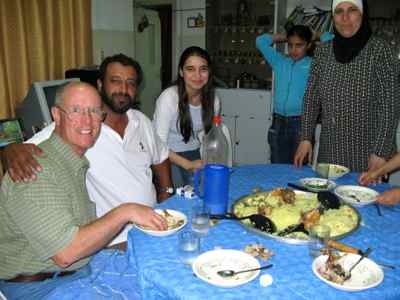 The normal "tour" is a two hour jeep ride, a night in a Bedouin camp with dinner and breakfast. 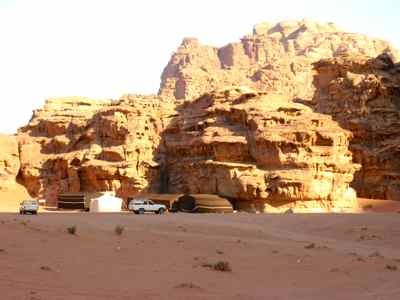 You can negotiate for a longer drive, and another couple of hour drive in the morning to really give you a sense of what Wadi Rum is all about. You take your chances on the wind... It was clear and calm the day we went. A couple of days later it was windy and it looked like a sand storm out there from the highway. Day 6 Morning drive in Wadi Rum. Lunch in Wadi Rum Village and a two hour drive to Aqaba... on the Gulf of Aqaba... an extension of the Red Sea. Aqaba is undergoing major growth. There are only a few hotels right on the beach, and they are all pricey, but there is construction everywhere. We stayed at the Intercontinental... a splurge for us, but welcome after spending the night in a Bedouin tent. Day 7 A Dive in the Red Sea and time to explore the city. Visited the Mamluke fort that Lawrence of Arabia attacked. Eating in town was much cheaper than eating at the hotel, and more fun. Again we felt perfectly safe walking around at night on our own. There are lots of restaurants to choose from. 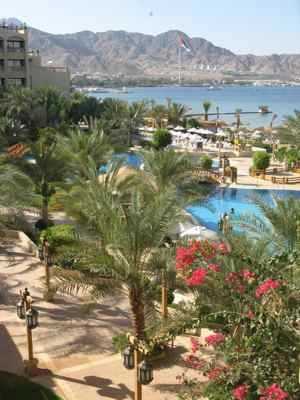 Day 8 Morning with more exploring Aqaba and enjoying the resort. Left at 2:00 pm for the 4 hour drive back to Amman. There is one airport hotel. Our buddy checked in because his flight left early the next morning. We just had dinner there, then went to the airport for our middle of the night departure. 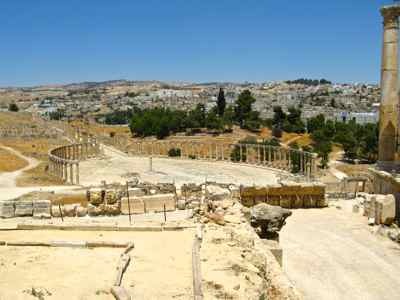 There are other Roman and Ummayid ruins to explore and Biblical sites. There is the River Jordan, though it is hard to visit and we never tried. 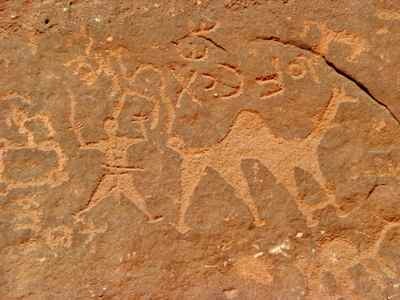 You could do camel expeditions into Wadi Rum, you can see the Desert Forts. Yep, a couple of more days would have been easy to fill, but we felt like we got a good look at Jordan. The food was good. There was plenty of "western" food available. The traditional Arabic dishes we tried were delicious. Beer and wine were available in certain stores and restaurants and in most of the hotels. When we stopped to pick up breakfast supplies for our Amman apartment stay, Atef took us to a Safeway! Everywhere we went we found at least someone who could speak English and help us. Remember what we say about foreign languages though.... at least learn how to say hello, good-bye please and thank you. It goes a LONG long way in any country. So if you've been wanting to play Indiana Jones and see Petra for yourself... go for it. 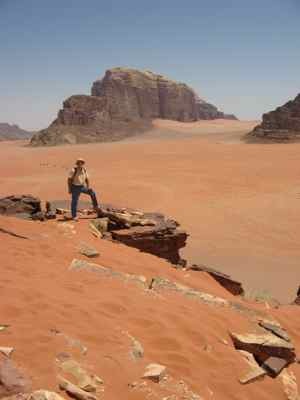 Jordan is easy to travel in.